A PERSONAL RECORD, Conrad’s meandering backward glance o’er the travelled roads of his “two lives” (101) as seaman and writer, was first serialized in the English Review in 1908 as “Some Reminiscences.” The work, published here in the Cambridge Edition, comprises Conrad’s digressive memories of Poland, Africa, and Southeast Asia, and the circumstances surrounding his initial decision to go to sea and his later, transformational emergence as a writer of fiction. Along with “A Familiar Preface,” added for the first book publication in 1912, and the “Author’s Note” written for Conrad’s collected works in 1919, the component parts of A Personal Record are here “published in a form more authoritative than any in which they have hitherto appeared in print” (167). While biographers have attributed to Conrad an incremental feline resourcefulness by typically adding a third life to the writer’s own already impressive total of two, the first of these later biographically structured inventions, Conrad’s world in nineteenth-century Poland, is one that appears in A Personal Record as effectively a launch pad for two subsequent, and very different, careers. Interestingly, this slim volume of autobiography comes to us edited by two scholars of Conrad’s work who seem to hold contrasting approaches to Conrad’s Polish heritage, the setting of some of the most important scenes in A Personal Record. In his recently revised Joseph Conrad: A Life (2007), Zdzislaw Najder devoted fifty pages to Conrad’s Polish youth, running a Polish narrative thread throughout Conrad’s life experience. In The Several Lives of Joseph Conrad (2007), J. H. Stape, as one recent review in the Independent noted, “drags Conrad out of the solemn Polish tomb Najder has buried him in” in the space of twenty pages. While accepting different markets and biographical styles and their effect on the scrutiny each biographer can conceivably give to Conrad’s relationship with Poland, one cannot help but be conscious of fundamental critical divergences. While these remain veiled for the most part, in some ways this edition nevertheless betrays a critical struggle between Stape and Najder over the reading of Conrad’s Polish years. A few examples: the Cambridge Edition of ’Twixt Land and Sea, published earlier in 2008 than the present volume, lists Conrad’s birth place in its Chronology simply as “Berdyczów in the Ukraine” (xix), adopting unambiguously the Polish spelling of the town, while here things are more specific, informing us that Conrad was “born in Berdyczów (officially, Berdychir) in the Ukraine” (xiv). One feels that it is also Stape who steps in to correct Conrad in the explanatory notes when Conrad writes that he was sent “away to Poland” (72), clarifying that Conrad was, in fact, sent away “to Ukraine, pre-Partition Poland” (216). At one point in the text, however, Conrad himself makes this distinction, explaining that he was “On my way to Poland, or more precisely to Ukraine” (30). On the issue of place-names, Najder emerges victorious from what might be called the recurring Battle of Lemberg, with the present-day Ukranian city of Lviv cited in its Polish form of Lwów throughout, but which features in Stape’s biography as Lemberg, the received and official Austro-Hungarian name for the city between 1772 and 1918. The accompanying cartographical illustration of the western regions of the Russian empire, which reproduces the very map featured in Najder’s recent life of Conrad, also represents a Polonized geography. However, as the introduction precisely notes, Conrad’s memories constitute those of his “family’s experience in the Polish Ukraine” (xxv), drawing attention, however obliquely, to the protracted question of shifting national identities in the outposts of the Russian Empire. 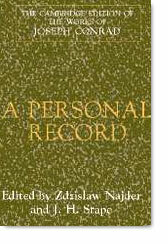 A Personal Record is the writing of an author who very early in his career had a clearly defined understanding of his idiosyncratic position in English literature. While writing “The Lagoon” in 1898, Conrad was aware that his stories were already considered to have inimitable and easily identifiable attributes, believing some of his short fiction contained “lots of second-hand Conradese” (CL1 301). By 1908, when he began to compose instalments of memories for the English Review, Conrad sought to capitalize on public and critical interest in the unusual journey he had taken to becoming a respected novelist. The introduction helpfully depicts Conrad’s public and private worlds in the early years of the twentieth century after the writing of some of his greatest works, outlining as much as is possible the elusive state of Conrad’s finances and the writer’s relationship with Ford Madox Ford in 1908. The circumstances surrounding the founding of the English Review are importantly treated, with the editors illuminating Ford’s relatively minor role in the composition / dictation of A Personal Record. Documenting the critical reception of A Personal Record in Britain, America, and Poland, the introduction reveals that most contemporary reviewers questioned the haphazard nature of the reminiscences, feeling that Conrad did not sufficiently reveal himself. However, Conrad perhaps foresaw such judgements, stating in “A Familiar Preface” that “these memories put down without any regard for established conventions have not been thrown off without system or purpose” (18). Conrad’s aim at one point had been to “make Polish life enter English literature” (CL4 138), but the final work, which Conrad came to believe had an artistic integrity all its own, does nothing of the sort. While Conrad takes the reader to Poland, it seems to be a springboard for a number of unapologetic standing jumps away from his homeland. The memories of childhood mostly take us out of the dark years of the 1863 Insurrection and back to the comically represented splendour of the Napoleonic period; those of early youth are concerned with Conrad’s coexisting desire and compulsion to get away from the tenebrous world of insurrection-era Poland, and the structuring device of the manuscript of Almayer’s Folly takes the reader with Conrad on his varied travels and through his improbable literary development. A Personal Record evolved into a rambling reflection on the two structuring forces in Conrad’s life; the sea and literature, and some of Conrad’s pathetically wistful suggested titles for the work, thankfully not chosen, disclose this idea: “The Pages and the Years – Reminiscences,” or The Double Call: An Intimate Note," which sets Conrad up like a busy, overly solicitous incarnation of Balzac’s country doctor. The introduction treats the pervasive but undocumented and ultimately unverifiable influence of Sterne’s Tristram Shandy on the text, presenting some useful detail on Sterne’s position in Polish culture in the nineteenth century. The usual forces blamed for provoking A Personal Record are also covered, including Robert Lynd, who clumsily reviewed A Set of Six in the Daily News in 1908, labelling Conrad a writer “without either country or language.” An appendix translated by Najder gives the intriguing relevant passages from Tadeusz Bobrowski’s memoir Pamietnik (1900), which Conrad borrowed from in evoking the life of Nicholas B. and in representing the haunting presence and silent memory of his mother. It should be noted that this edition sees the introduction and accompanying textual essay and apparatus nicely weighted to complement the brevity of the main text, as opposed to the recently published Cambridge ’Twixt Land and Sea, which saw three stories somewhat lost amidst an extended and prolix introduction and accompanying scholarship. Opening in Rouen in the company of the “only banjoist” of Conrad’s acquaintance, a figure who gazes in silent contemplation at his wondrous instrument, the sound of the “precious banjo” (20) attends the image of Conrad existing hesitatingly between the two contradictory lives of seaman and writer. The editors in the explanatory notes, which also elsewhere finely document allusions to Anatole France and Thomas Gray, amongst others, bring Conrad’s forgotten musical subordinate back to posterity as Richard Cole with some investigative research into the 1901 Census. The evolution of Conrad’s Almayer’s Folly is also watched over by the shade of Flaubert. Following the introductory focus on the textual history of A Personal Record, “Conrad’s major public statement about the events of his life” (xxi), the work emerges as an autobiography overwhelmingly concerned with the issue that occupied the energy of the editors: namely, the assessment of documents; their estimation, destruction, value, and loss. Asserting that “Books may be written in all sorts of places” (19), throughout the unfolding text Conrad draws attention to the difficulty of acquiring literary coherence through images of discarded letters, manuscripts, vacant maps, while treating the subject of historical and literary authenticity with remarkable frequency. Conrad recalls his father burning his manuscripts, only to remember that they mysteriously turned up again in the Jagiellonian Library in Cracow in 1914; Almayer’s Folly survives various mishaps as a “wandering manuscript” (31); Nicholas B. destroys most of his papers and letters; his house is later sacked, scattering Nicholas B's remaining correspondence, books, and medals. The character of X “displayed great cleverness in the art of concealing material documents (he was even suspected of having burnt a lot of historically interesting family papers)” (57). Conrad’s desk during the composition of Nostromo becomes a Stendhalian battlefield of manuscripts, filled with valiant, wounded, and dying volunteers: “There were pages of MS. on the table, and under the table, a batch of typed copy on a chair, single leaves had fluttered away into distant corners; there were living pages, pages scored and wounded, dead pages that would be burned at the end of the day – the litter of a cruel battlefield, of a long, long and desperate fray” (92-93). Conrad charts his biographical and historical heritage along with an acknowledgement of the role played by a great European tradition of letters in his literary education. However, this intellectual development is carefully represented as one that stands outside any institutionalized encounter with literature; it is rather a personal, unsystematic journey through the works of Shakespeare, Dickens, Flaubert, Cervantes, and Hugo that mirrors the author’s own peripatetic existence. Conrad portrays himself as an embodiment of the free and wandering narrative style of A Personal Record. Arriving in London, he "explored the maze of streets east and west in solitary leisurely walks without chart and compass. Till I began to write that novel I had written nothing but letters and not very many of these. I never made a note of a fact, of an impression or of an anecdote in my life. The conception of a planned book was entirely outside my mental range when I sat down to write" (69). Indeed, Conrad’s autobiographical method connects to an oral narrative tradition, seeking to assemble impressions whose “accumulated verisimilitude of selected episodes puts to shame the pride of documentary history” (28). After the introduction’s piecing together of the composition and publication dates of the various parts of the text, it is possible to discern some shifting approaches to history in Conrad’s work. The relatively ironic and distanced attitude to Poland in “Some Reminiscences” is replaced with a poignant evocation of Conrad’s parents in the 1919 “Author’s Note,” reflecting Conrad’s post-First World War re-evaluation of the significance of the nineteenth century and his attempt to reach a vanished European past. The politically active figures of Conrad’s childhood now appear “beyond the usual stature of mankind as I got to know them later in life” (7-8). These “shades” of Conrad’s past still maintain a “haunting reality” that “shall pass forever with me out of the world” (8). If the authorial figure behind the veil remains hidden throughout, this is because Conrad was reshaping his identity and his attitudes to the past at each stage of the composition of A Personal Record. While the text escorts the reader through Conrad’s life with an intentional lack of guidance, Conrad was determined in the later composed “A Familiar Preface” to influence readers’ interpretations and to steer clear of his popular reputation as a sea writer, having only “two exclusively sea books” and a “few short sea-stories” (13). There is also a Dantean acceptance that the writer has reached the “middle turn of life’s way” (15). A Personal Record concludes with the young Conrad in Marseilles and his first encounter with the English language and a British ship. Conrad’s initiation in the handling of a boat’s tiller off the coast of Marseilles is connected to the adventurous spirit of childhood literature, as Conrad enters the scenes of Alexandre Dumas’s Le Comte de Monte-Cristo: “There was a great solitude around us; the islets ahead, Monte Cristo and the Château d’If in full light, seemed to float towards us – so steady, so imperceptible was the progress of our boat” (115). Just as Conrad’s own use of English would always maintain a Gallic flavour, a revisiting of the world of inspiriting French Romanticism brings on his first encounter with the British Merchant Service and his induction into another of his many lives. In “The Texts: An Essay,” the editors note that the textual history of A Personal Record is “relatively straightforward” (128). Challenging the accepted view of these years of Conrad’s career which sees A Personal Record as a hindrance to Conrad’s work on Under Western Eyes, the editors believe that the former work “displaced” the latter, “becoming Conrad’s main project during the autumn of 1908” (140). There is also a useful discussion of editorial emendations to Conrad’s style by Harpers and Dent that concludes with an important piece of demythologizing: “Cumulatively, such gentrifying alterations produced an image of Conrad as a more “correct” and idiomatic writer of English than he, in fact, was” (157). One or two factual errors have crept into the introduction, explanatory notes, and textual essay. The first is that the introduction mentions “the land reform proclaimed in 1864 by Tsar Alexander II” (xxxvi), which liberated the serfs, when 1861 is the correct date for this event (although the editors may be referring here to specific land-reform in Poland). Secondly, and pedantically, one must admit in pointing it out, the textual essay once (145) directs the reader back to a discussion of Rousseau on page 89, when the passage mentioned is on page 88. Most significantly, the presence of Napoleon Bonaparte that haunts the pages of A Personal Record through Conrad’s evocation of the Napoleonic campaigns of Nicholas B. and the recollection of Conrad’s encounter in Marseilles in 1874 with an “Ancient” who remembered as a boy Napoleon’s escape from Elba rises again to trouble the historical record. The details and dates of Napoleon’s escape from Elba and the ensuing Flight of the Eagle and the Hundred Days have defeated the editors in a close-run battle. The notes indicate that the Hundred Days was the “period between Napoleon’s escape from exile on Elba on 20 March 1815 and his abdication after the defeat of Waterloo on 22 June 1815” (213). Napoleon escaped on 26 February 1815, landing in France on 1 March. The Hundred Days refers more specifically to the time between Napoleon’s arrival in Paris on 20 March, after the Flight of the Eagle (his journey northwards to Paris through eastern France during which the French military and population rallied to him) and the restoration of Louis XVIII after the Battle of Waterloo. Elsewhere, in what is presumably a typographical error, the notes state incorrectly that “Napoleon returned from exile on Elba in March 1814” (226). Overall, however, this edition inevitably brings together everything one would expect from the Cambridge Conrad: authoritative scholarship, elegant presentation, fine introductions detailing the genesis, composition, publication, and reception of the work, and a detailed textual essay and apparatus. All this comes beautifully bound and still obstinately enveloped in a dust-jacket salvaged from fading brown wallpaper found at Bessborough Gardens when the series began production in the last century.